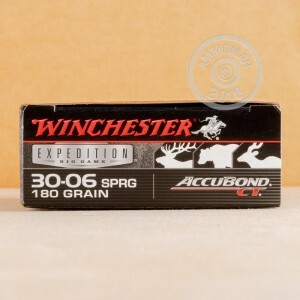 This ammunition combines the reliability and consistency of Winchester ammunition with the deadly terminal ballistics of Nosler AccuBond bullets. 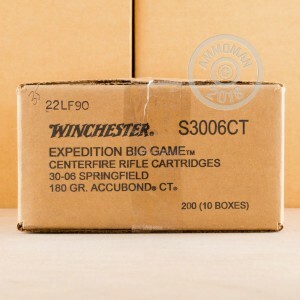 Each .30-06 Springfield cartridge in this box of 20 fires a 180 grain polymer tipped bullet at a muzzle velocity of 2,750 feet per second, delivering excellent accuracy even at long range against boar, deer, elk, and even larger thin-skinned dangerous game. The Nosler AccuBond bullet is named for its bonded-core design, which keeps the jacket and core from separating on impact and wasting the projectile's energy. AccuBond bullets have a polymer tip that gives them excellent ballistic efficiency in flight and helps initiate the expansion and produce a high-diameter mushroom. These cartridges use non-corrosive Boxer primers and brass cases. 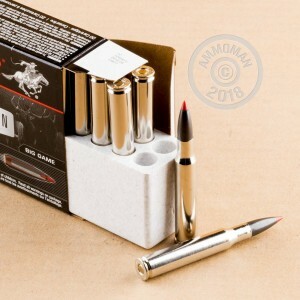 AmmoMan.com is your one stop shop for top quality ammunition from all over the world including the best American brands. Place an order for $99 or more and get free shipping!